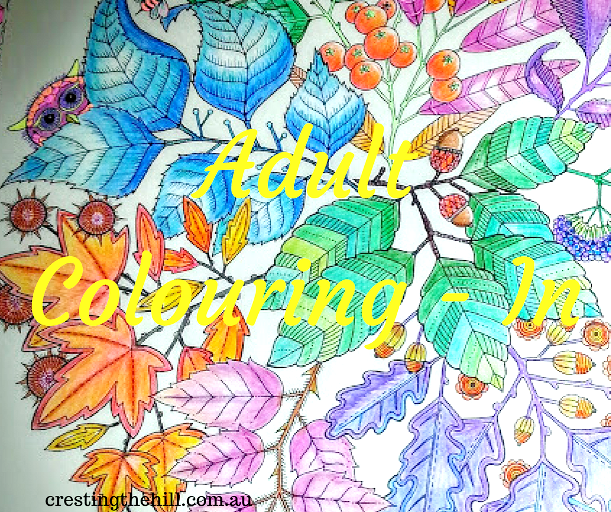 All through my adult life I have had a secret love - unfortunately there isn't anything remotely romantic or exciting about it, but it is something I find relaxing and strangely satisfying.....Yes it's colouring in. I thought I was the only grown-up in the world who loved spending time choosing colours and finishing pictures but it turns out that there are a lot of us out there. I think my love of colouring in partly stems from my total lack of artistic ability - I can't draw or paint or sculpt or even stick things in straight - see my AntiCraft post! So I take great pleasure in finding a picture that someone else has drawn and colouring it in. It's also a great way to zone out a bit - it seems to use the part of my brain that forgets time and place and I just end up in my own little world. It's a remarkably relaxing break in a stressful life. A couple of years ago I started finding articles online about other women who liked to colour in too. There was this article in The Telegraph all about women in France who had discovered the joys of colouring and have set up facebook pages (with over 1,000 followers) and all sorts of like minded groups who get together to colour-in. They even designed their own colouring in books with really complex drawings, rather than your usual cute animals and fairies that they make for children. Apparently colouring books are more popular than cookbooks over there. After that I felt quite vindicated in my choice of pastime - I can even admit to it now and other people don't think it's a really strange thing for a grown woman to do. I don't even have to wait for my lovely little grandbaby to grow up to legitimise buying colouring in books and textas and colour pencils - although I'm sure we'll be colouring in together whenever we get the chance. I remember not so long ago the only options were kids' colouring in books, I had a couple of Barbie books, based on the Barbie movies, that my daughter bought for my birthday (in case you aren't aware, Barbie leads a very exciting and colourful life!) or downloading pictures from the internet (I'd just Google "adult colouring in pictures") to print off and indulge myself. 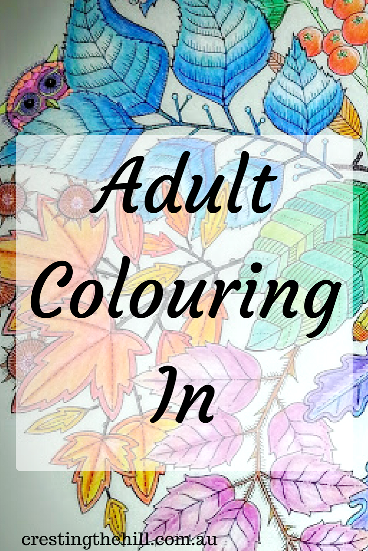 Now there are adult colouring in books EVERYWHERE! They are in the newsagents, the supermarkets, our local bookstores, they even have Christian versions in the Christian bookstore we go to occasionally. It seems like everyone has jumped on the bandwagon. Then there are the textas, and the gel pens, and the sparkly colours and the different varieties of pencils, and on it goes. I've been having a ball - that's one of my pages at the top of the post - and there are a multitude more at home. This Christmas brought with it a little surprise - I thought I'd seen all there was on offer in the new adult colouring sphere, until our son presented me with the next level up. 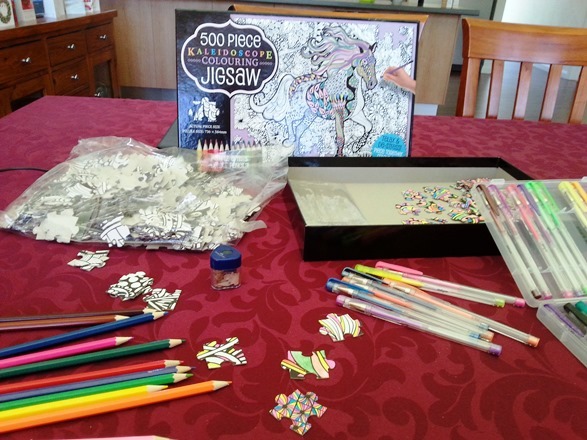 An adult colouring jigsaw - as he said, it combines both my loves and should be fun. "Fun" is not quite how I'd describe it - time consuming and endless would be closer to the point! It "only" has 500 pieces but each one takes a few minutes and I'm not even half way through. It has given me a whole new understanding of patience and perseverance, and something to keep busy with over my holidays. And it will be interesting to see the end result. It's also how we spell it in Canada! 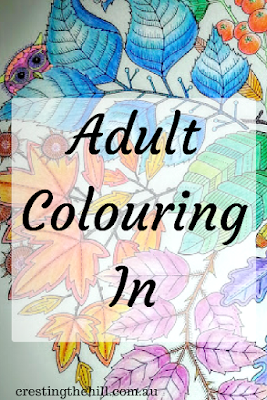 I love colouring in too Leanne but when I've been given some Adult Colouring books I've felt stressed rather than relaxed as they are so intricate. I've been watching a gentleman where my MIL lives in the aged care facility and his passion is jigsaw puzzles 500 - 1,000 pieces. I was actually thinking of getting one myself but to combine the two jigsaws and colouring you must be in 7th heaven. I love jigsaws - especially ones with lots of colour and variety in them - NEVER buy one that is all trees or huge amounts of water or sky - it will do your head in :) This colouring one is taking up way more time than it should, but it's fun to stop and start as I feel the urge. Those coloring books are really popular over here too! People are even creating them and selling them on Amazon. I want to see the colored jigsaw when you get it finished. 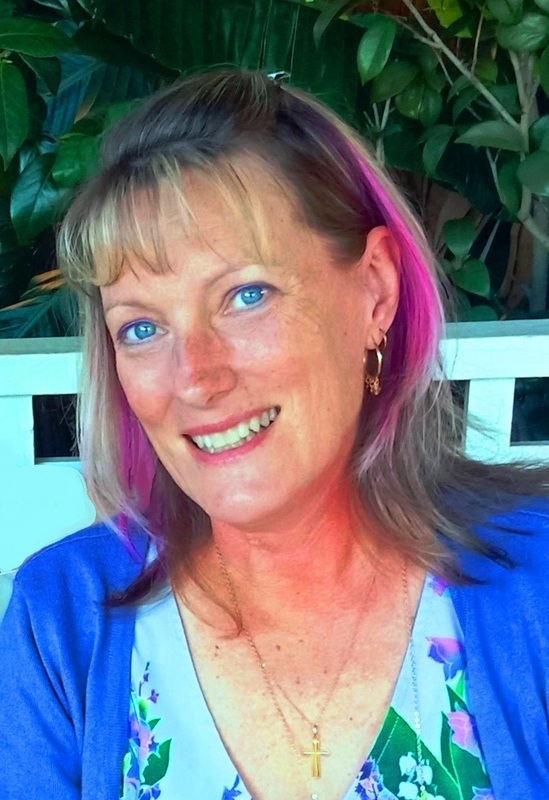 I'd frame it if I were you :) Thank you Leanne for sharing this post at the #WednesdayAIM #LinkUp #BlogParty. I shared it on social media. The other morning the child came down early. 6 AM. Later in the day she mentioned she had been up since about 430. What did you do in bed I asked her. Color! She responded. It was only a few years ago when I thought I was the only adult in the world who secretly liked to colour in still Carla - then it just went ballistic and every woman and her dog had a book on Amazon. I'm still looking forward to going back to basics and colouring in with my granddaughter one day when she's old enough. I don't think I'll ever finish the book I'm doing Laura - I have a second one waiting and I may just start jumping between the two of them! For my 'letting my mind rest' time, I do puzzles. Intrigued by your colouring puzzle! They are my holiday treat Diane - when I have a few days with nothing better to do than pick and place pieces - my colouring one is a whole new level! I have never seen a puzzle that you can color! I do enjoy coloring and brought my own book and colored pencils on our last family vacation. My husband thought I was a bit nuts. It's quite a challenge really - I'm colouring the pieces first (and randomly choosing colours) so fitting it together at the end is going to be very interesting indeed! Hi I'm Janet and I'm a fellow jigsaw puzzle addict ;-) . I've seen some felt pens advertised online that you can actually vary how intense the colour is - what a great idea! Need me some of them I think! gel pens are my downfall Janet - and they come in glitter colours! and jigsaws are just so relaxing - except those really hard ones - I did a 1,000 piece one of the Lady of Shallott once - all browns and really tested my skills! I love coloring too. I have some of the coloring books for adults, and I like them, but my favorite is still coloring with the grandchildren in their books--the princesses, cartoon characters, and superheroes! I used to love to colour. I have a grown up colouring book on my coffee table but I just don't have time to do it. When I do have a spare 10 minutes over a cuppa, I choose crosswords instead. I'm sure there's a travel one out there you could tackle Kathy! I love colouring in too! Admittedly, I only discovered it after it became a trend. That puzzle looks amazing!